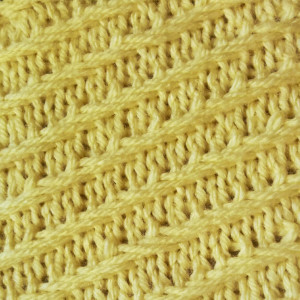 The Woven Diagonal stitch is a knitted pattern made to resemble weaving which runs diagonally across the work. Done in a multiple of 6 stitches plus 2 and is a 6-row repeat, this stitch is perfect for edge-work and accents for all types of knitting projects! Blocking is recommended for optimal results. Note: always slip stitches purlwise unless otherwise noted. Row 1 (RS): k1, *k1, sl 3 wyif, k2; rep from * to the last st, k1. Row 2: p1, *p3, sl 3 wyib; rep from * to the last st, p1. Row 3: k1, *sl 2 wyif, k3, sl 1 wyif; rep from * to the last st, k1. Row 4: p1, *sl 2 wyib, p3, sl 1 wyib, rep from * to the last st, p1. Row 5: k1, *k3, sl 3 wyif; rep from * to the last st, k1. Row 6: p1, *p1, sl 3 wyib, p2; rep from * to the last st, p1.